Christmas is the perfect time to break out your crochet needle and festive yarn. You can make wonderful crocheted Christmas gifts for friends and family, and crocheting is a fun activity to do on cold winter nights. You can also create projects to decorate your home for the holidays, to give as gifts, or to sell at seasonal craft sales. 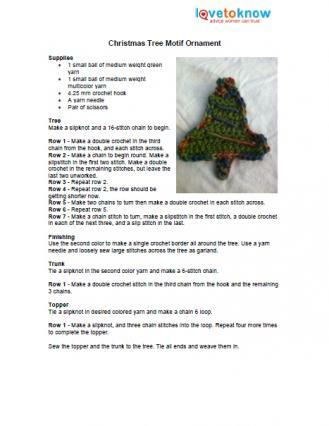 Crocheting Christmas tree ornaments requires minimal supplies and equipment, and you can create several of them in an evening. Use patterns for small projects like these to use up leftover odds and ends of yarn. 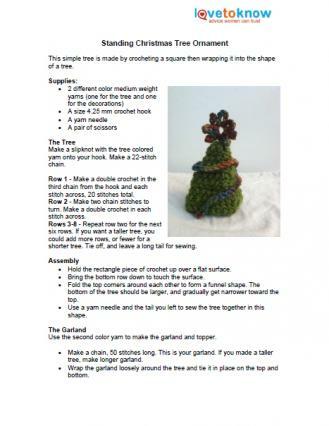 This simple tree is made by crocheting a square then wrapping it into the shape of a tree. When you're finished, hang them on your tree using ornament hooks or stand them anywhere for a decorative touch. Use whatever colors of yarn you have available. If you need help downloading any of the printables, check out these helpful tips. Click to download a printable pattern for this ornament. Make a slipknot with the tree colored yarn onto your hook. Make a 22-stitch chain. Row 1 - Make a double crochet in the third chain from the hook and each stitch across, 20 stitches total. Row 2 - Make two chain stitches to turn. Make a double crochet in each stitch across. Rows 3-8 - Repeat row two for the next six rows. If you want a taller tree, you could add more rows, or fewer for a shorter tree. Tie off, and leave a long tail for sewing. Hold the rectangle piece of crochet up over a flat surface. Bring the bottom row down to touch the surface. Fold the top corners around each other to form a funnel shape. The bottom of the tree should be larger, and gradually get narrower toward the top. Use a yarn needle and the tail you left to sew the tree together in this shape. Use the second color yarn to make the garland and topper. Make a chain, 50 stitches long. This is your garland. If you made a taller tree, make longer garland. Wrap the garland loosely around the tree and tie it in place on the top and bottom. Make a chain six loop. Make a slip stitch and five single crochet stitches into the loop. Repeat six more times. End with a slip stitch and tie off, leaving a long tail. Sew the topper to the top of the tree. Cut and weave in all ends. This Christmas tree looks great hanging on a tree or adorning a package. Feel free to use whatever yarn you have on hand for various colors of trees. Download a printable pattern for this Christmas tree. Make a slipknot and a 16-stitch chain to begin. Row 1 - Make a double crochet in the third chain from the hook, and each stitch across. Row 2 - Make a chain to begin round. Make a slip stitch in the first two stitch. Make a double crochet in the remaining stitches, but leave the last two unworked. Row 3 - Repeat row 2. Row 4 - Repeat row 2, the row should be getting shorter now. Row 5 - Make two chains to turn then make a double crochet in each stitch across. Row 6 - Repeat row 5. Row 7 - Make a chain stitch to turn, make a slip stitch in the first stitch, a double crochet in each of the next three, and a slip stitch in the last. Use the second color to make a single crochet border all around the tree. Use a yarn needle and loosely sew large stitches across the tree as garland. Tie a slipknot in the second color yarn and make a 6-stitch chain. Row 1 - Make a double crochet stitch in the third chain from the hook and the remaining 3 chains. Tie a slipknot in desired colored yarn and make a chain 6 loop. Row 1 - Make a slipknot, and three chain stitches into the loop. Repeat four more times to complete the topper. Sew the topper and the trunk to the tree. Tie all ends and weave them in. Homemade Christmas tree ornaments are great for adding a personal touch to your seasonal decoration collection. These ornaments are also a nice way to embellish gifts. Friends and family will appreciate your handiwork and the thought that you put into making them something unique.